Dating back to the beginning of time, play has been an integral component of childhood. As we have evolved, so has the progression of play. According to Fred Rogers, “Play is often talked about as if it were a relief from serious learning. But for children, play is serious learning. Play is really the work of childhood.” There is growing concern that the current generation of children is facing unparalleled challenges in the areas of obesity, inattention, hyperactivity, anxiety, and depression. While lifestyle has been cited as a catalyst for the increase in these etiologies, lack of natural play opportunities are partially to blame. There are years of research linking play to language development, social/emotional intelligence, problem solving, and motor coordination. When you invite George’s Gym into your home, it is not just play, rather the building blocks of childhood. According to L.R. Knost, “For a child, it is in the simplicity of play that the complexity of life is sorted like puzzle pieces joined together to make sense of the world”. 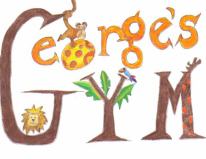 By partnering with George’s Gym, you are continuing to support the research behind the fun. Through play dates, tumbling classes, and birthday parties, children are consuming the ingredients of healthy development.